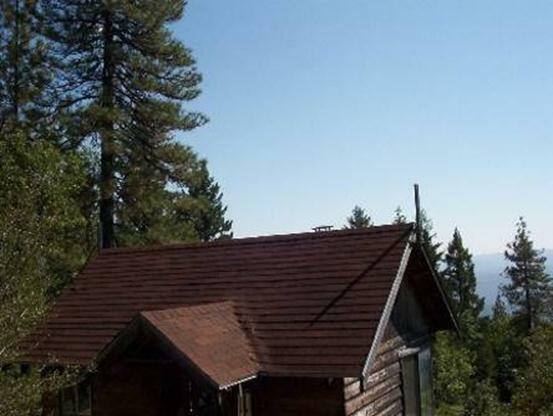 This presentation is a simple layman’s study of some interesting aspects of Earth’s orbital history, especially concerning solstices and equinoxes, and the changing lengths of the days, seasons, and years. The charts below are from an Excel spreadsheet, created with an open source Excel Add-In, both of which I am making available at the end of this webpage: as I would have loved to have started out with something similar 10 years ago, when I first became interested in “the motions of the heavens” and the workings of the solar system. My first inquiry concerned the “mean tropical year”: why does it change? It is mostly due to the changing speed of the precession! 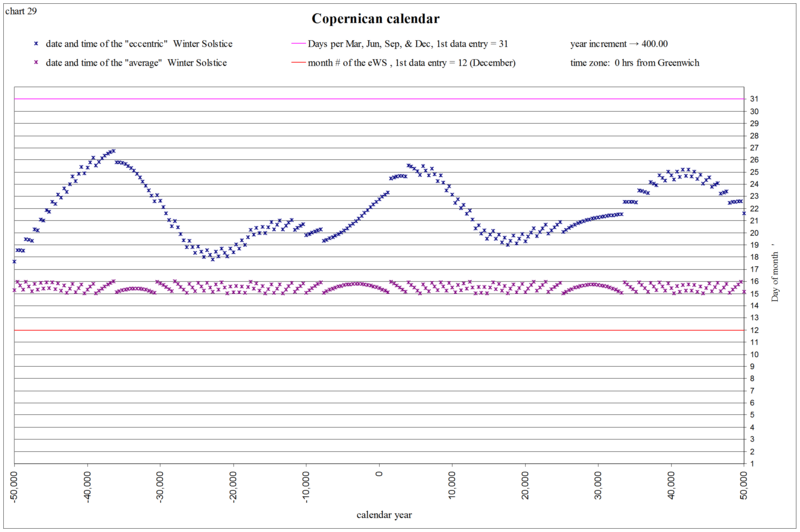 The rate of precession is shown below in arcseconds per Julian year (365.25 days), a standard time increment used by astronomers. The precession and the obliquity are from Jacques Laskar (et al 1993), an awesome astronomer at the Bureau des Longitudes in France who applies the concepts of Newton’s equations of motion to the entire solar system for millions and millions of years! He then approximates his results with one single equation (called a quasi-periodic approximation) that is very close to the “true solution”, at least for a few millions of years. This one for the precession and obliquity gives good results for 18 million years in the past, according to his solution usually designated La93(0,1), and it also gives good approximate results for 2 million years into the future. The Add-In can calculate with either the quasi-periodic approximation formulae, or from 7th-order polynomial expressions that interpolate the data from his La93(0,1) solution. The spreadsheet used to create these charts also uses the formulae from Laskar 1986 (valid for ±10,000 years from J2000), providing a comparison during the time period “closer to home”. It is mostly due to the changing eccentricity and motion of the perihelion! 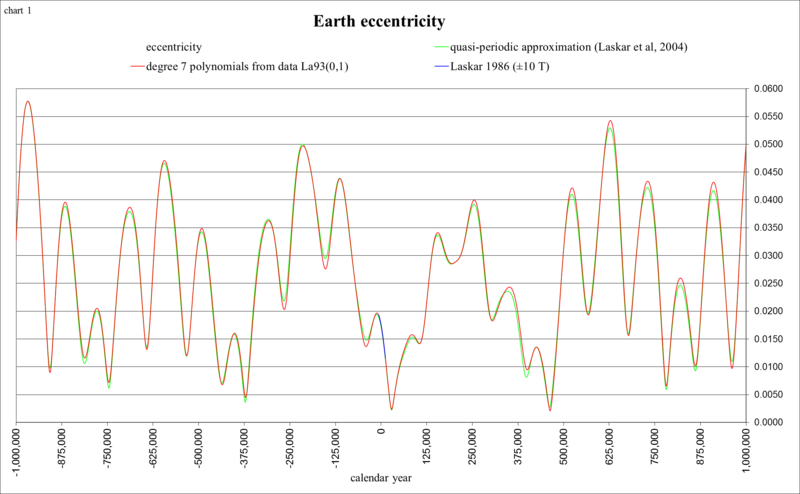 Laskar (et al 2004) has developed another approximation formula for both the eccentricity and perihelion, valid from −15M (million years ago) to +5M (million years in the future). Again the Add-In has retained good accuracy by interpolating Laskar’s 1993 data with polynomial expressions. The method used is on p.32 in the book “Astronomical Algorithms” by Jean Meeus (1998), referred to as “Lagrange’s interpolation formula”. 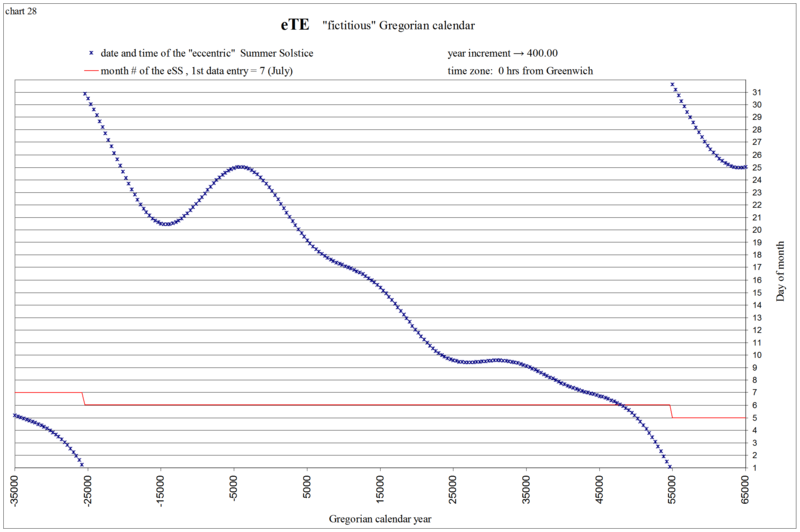 One of the most interesting things that I’ve learned is that not only is there the “mean tropical year”, there are 4 separate “true” tropical years, measured from vernal equinox to vernal equinox (VE to VE on the chart below), summer solstice to summer solstice (SS to SS), autumnal equinox to autumnal equinox (AE to AE), and winter solstice to winter solstice (WS to WS). 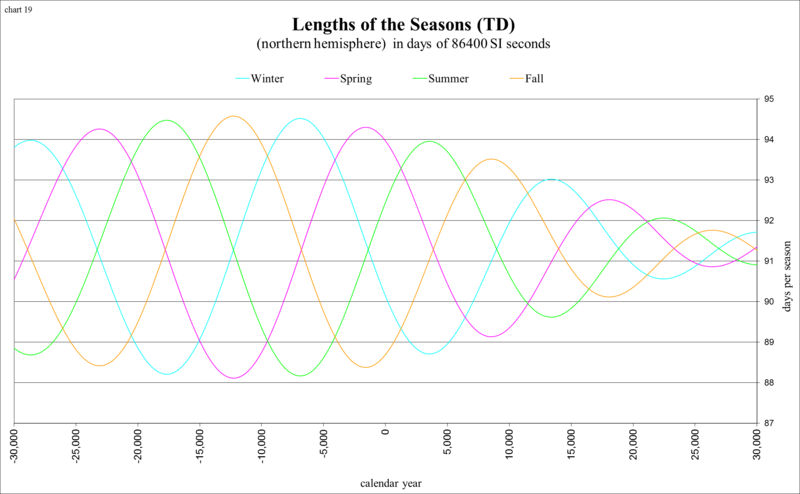 The “names” of the seasons (and the tropical events) on these charts are those of the northern hemisphere (southern hemisphere readers should of course swap the names “winter” and “summer”, and also the names representing “spring” and “fall”). 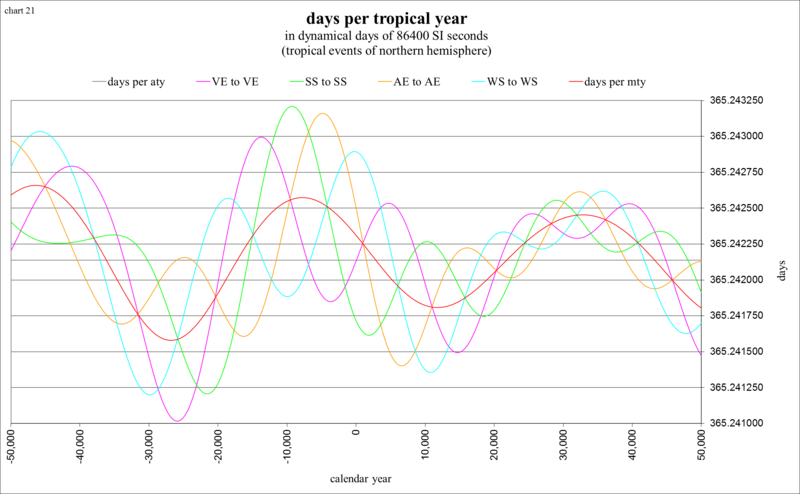 You can see from this chart how the “true” tropical years vary about the mean tropical year (mty), and how the mean tropical year varies about the “average” tropical year (aty). 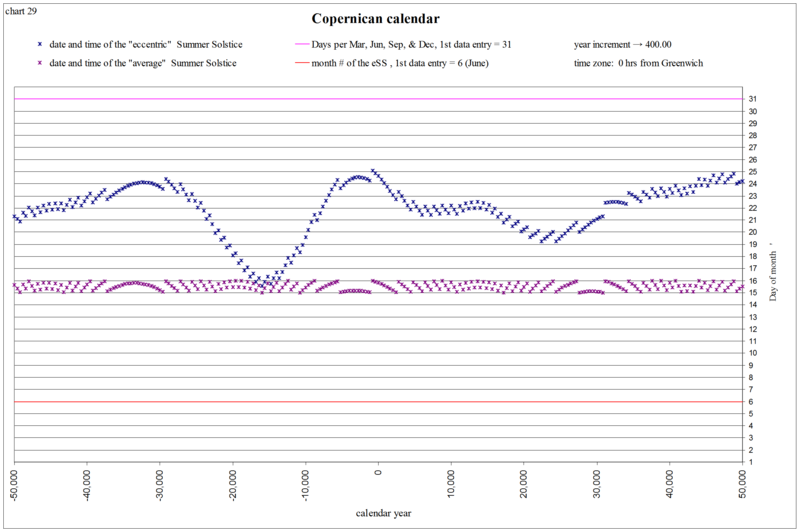 The average tropical year is determined from the “average” length of the sidereal year (~365.256362) and the “average” rate of precession (50.4712 arcseconds per Julian year, by use of the solution La93(0,1)), so that, for this study, the average length of the tropical year is ~365.242138. 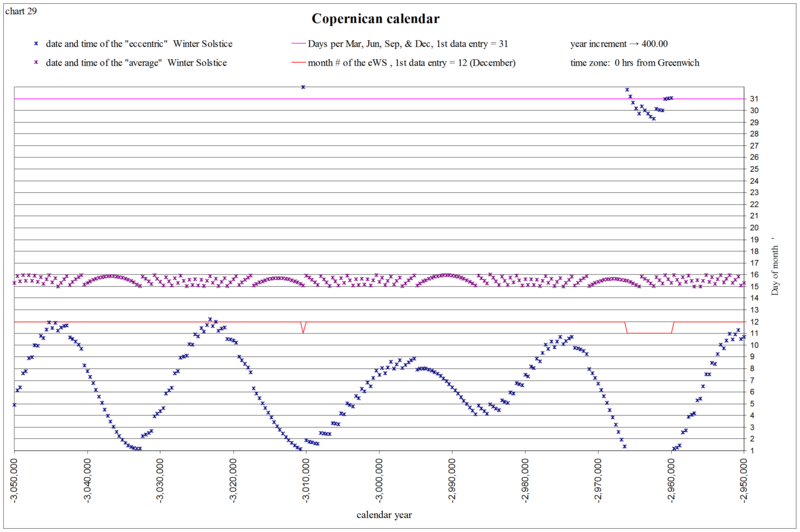 These previous charts are all in dynamical time, based on the well defined scientific second determined by atomic clocks, and counted in days of dynamical time equal to 86400 seconds per day. 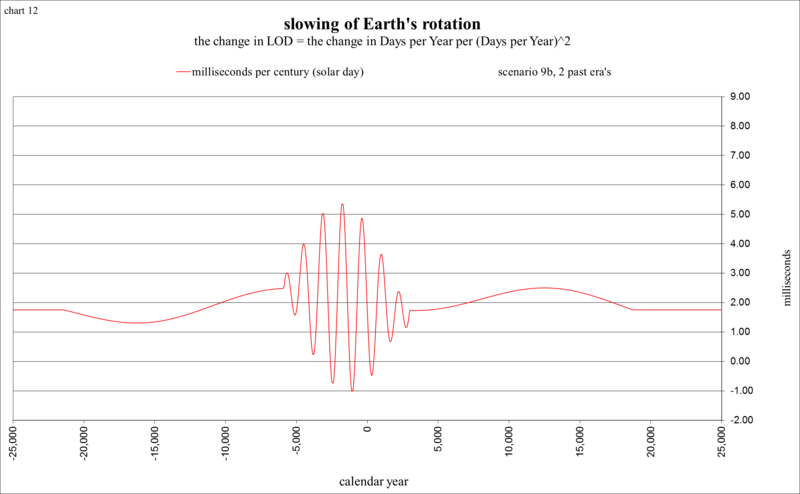 Let’s look at the lengths of the years during a longer time span and compare dynamical time to Universal time, which measures mean solar days of Earth rotations, known to be lengthening as Earth’s spin rate slows down, mostly due to tidal friction. 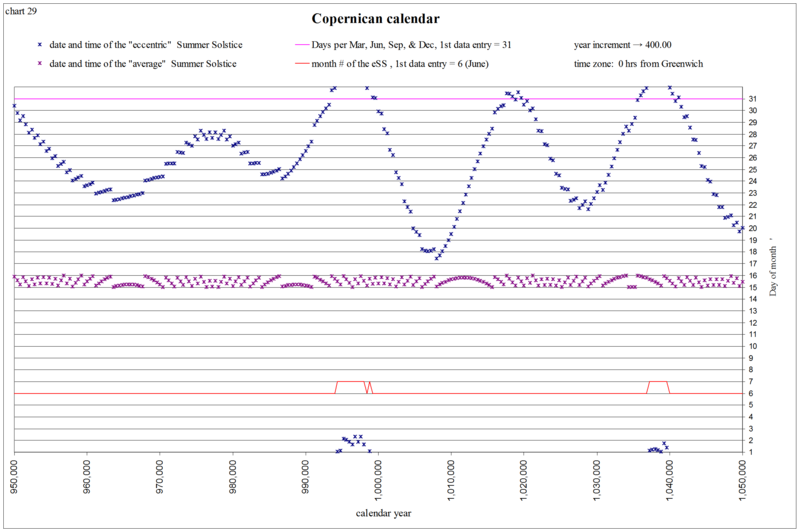 To avoid confusion between the dynamical time scale of days and the Universal time scale of days, these charts have used days (with a lower case d) to designate dynamical time (TD), and Days (with a capital D) are used to designate mean solar days of Universal time (UT). What a difference! 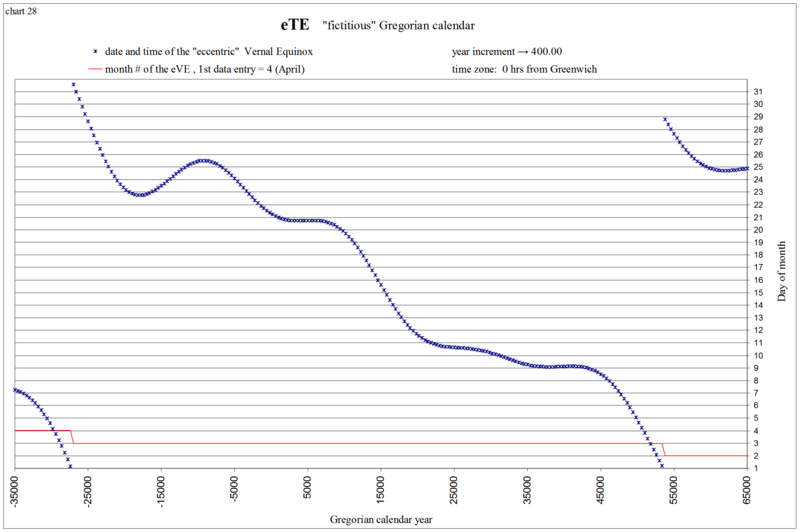 In this chart the dynamical time is converted to Universal time by showing the length of day (LOD) to be currently increasing by 1.7 ms/cy (milliseconds per century), a value determined by F. R. Stephenson (1997) from studies of eclipse records during the past 2700 years. This particular “scenario” in the spreadsheet shows the rate of change of LOD to be slowly increasing to a more scientifically expected rate of 2.3 ms/cy at ±100,000 yrs. I also like to study the calendar, and the dates and times of solstices and equinoxes. 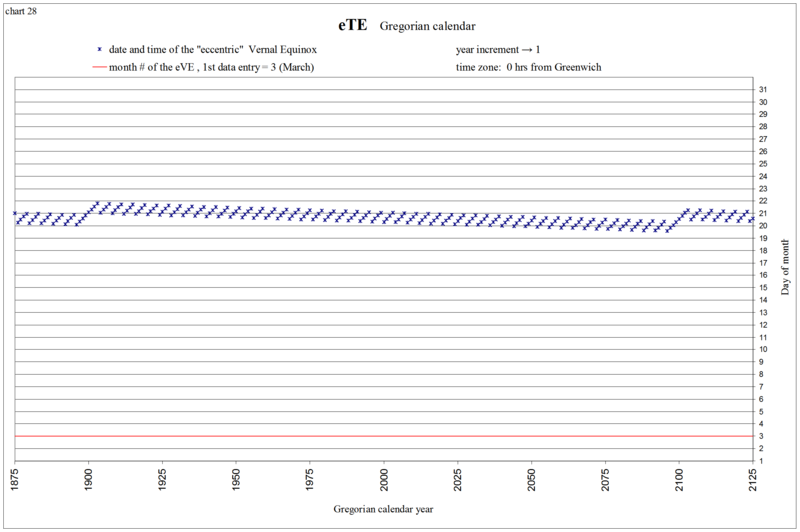 These next charts show the dates and times of the vernal equinox every 10 years from −500 (501 BC) to +2000 (2000 AD) in both the Julian calendar and the Gregorian calendar, in the time zone of Rome (+1 hrs from Greenwich). C₁+ r t² + ∑²Sin(a t + c)/a + d is used from −21,410 to −6106 and from 2668 to 18,749. Morrison and Stephenson (2004) is used from −4.5M to +4.5M, and the integral of an equation given by Deubner (1990) is used from −4.5G until +5G. I also enjoy studying this rate of slowing for the entire history of the Earth-Moon system, from −4.5G (billions of years ago) until +5G (billion years in the future), when the Sun is expected to become a Red Giant, boiling the oceans and scorching the Earth! Intricately tied to the slowing of Earth’s spin rate is the Moon, due to the tidal friction that it causes. From our laws of physics (conservation of angular momentum), as the Earth’s spin angular momentum decreases, the Moon’s orbital angular momentum must increase, so that the total angular momentum is conserved. 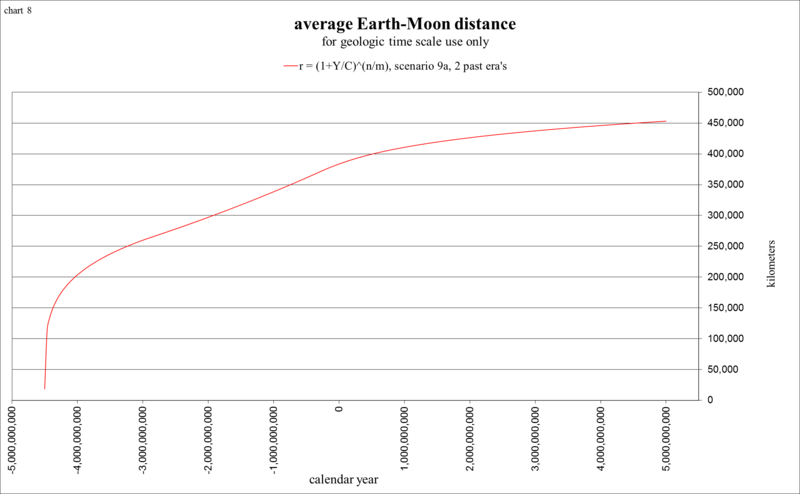 In order for the Moon’s orbital angular momentum to increase, the Moon must increase its distance from Earth, and that is why we measure the Moon to be moving away from the Earth at a rate of 3.82 ±0.07 centimeters per year (Dickey et al, 1994). Most of the scenarios use an equation for Earth-Moon distance given by Walker and Zahnle (1986), in which you can change the parameters. Then the Earth-Moon distance is applied to an equation given by Deubner (1990) to obtain Days per year. It is supposed to obey the conservation of angular momentum and include the effects of the solar tides. Some parameters of this equation are also changeable. 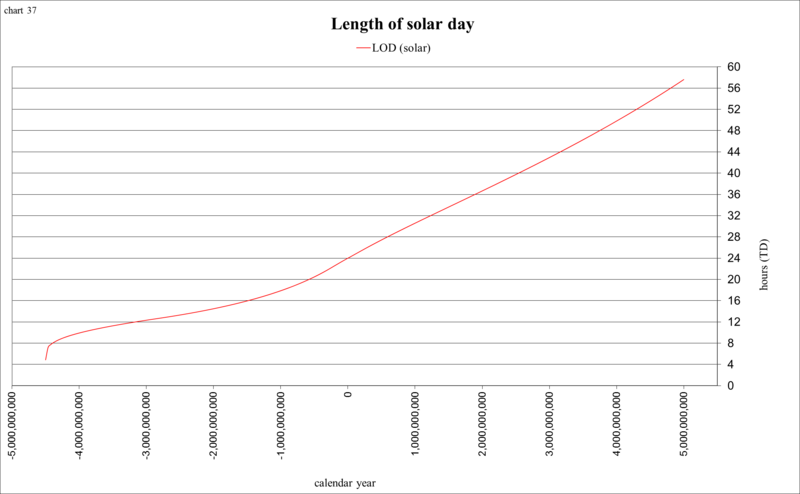 The integral of Deubner’s equation is then used to count the accumulated number of solar days during any time span. 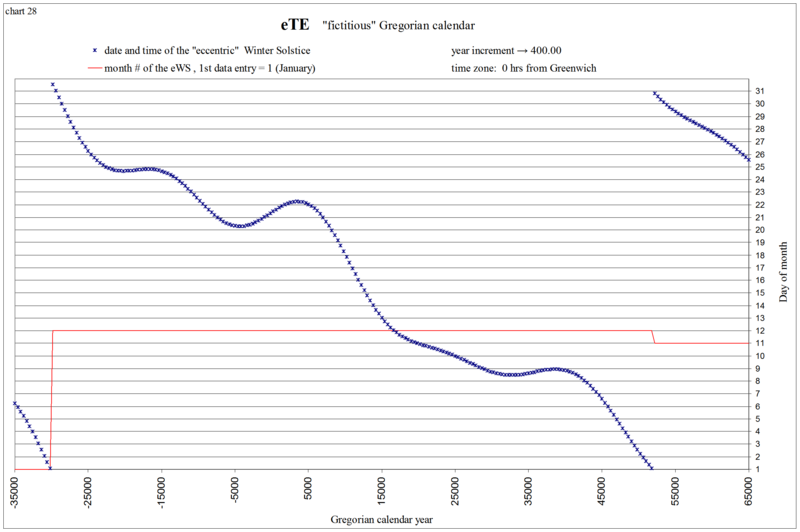 Then the difference (dynamical days since 1820) − (mean solar days since 1820) = ΔT in days. 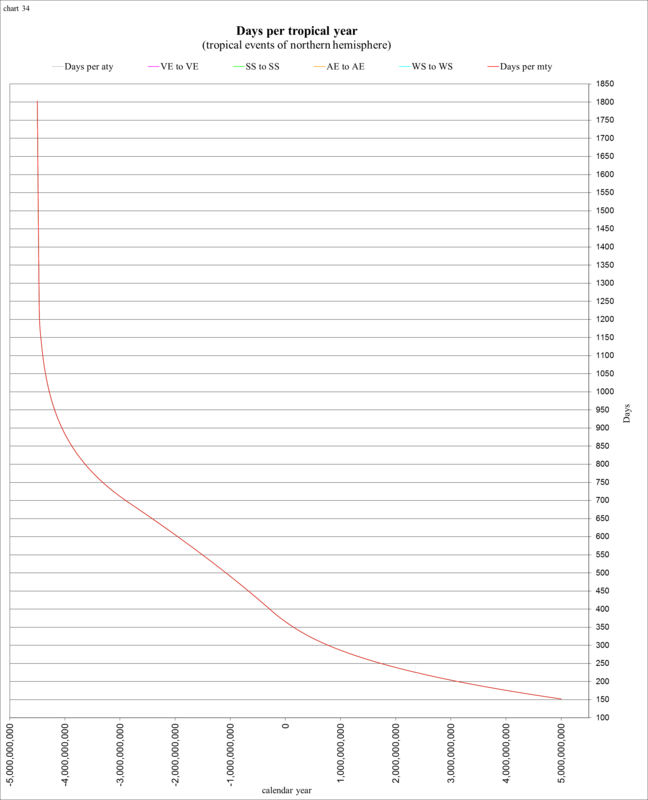 Multiply by 86400 to obtain seconds, and subtract 20 seconds to correspond to the dynamical time scale of the Julian day numbers, which is set so that dynamical time = Universal time at ~1900 AD. To continue with our study of solstices and equinoxes beyond ±6000 yrs from J2000 (the range of validity for the times calculated by the method of Bretagnon and Simon, 1986), the spreadsheet uses the “mean orbital elements” from Laskar (1986, 1993). The accuracy then reduces to about ±20 minutes of dynamical time. That is, as long as the orbital elements are “correct”. The reason for the ±20 minute “error”, even when using correct mean orbital elements, is that this assumes the Earth to be in a purely elliptical unperturbed Keplerian orbit at the Earth-Moon barycenter. The nutation (caused mainly by the Moon) accounts for ±10 minutes, and the other ±10 minutes is due to the perturbations of the planets (especially Jupiter!). The “constant” of aberration (20.5 arcseconds, amounting to ~8.31 minutes of time) has been included, so that the variations throughout the year (±8.5 seconds) are negligible (at the accuracy of 20 minutes!). By use of the quasi-periodic approximation formulae (instead of the data) the error can of course be much greater. 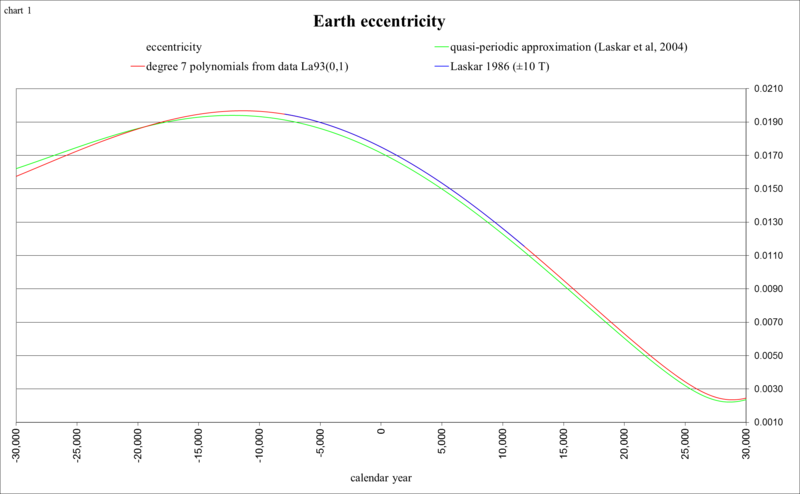 For ±300,000 yrs the difference in precession can amount to a ±20 hour error, while use of the approximation formula for eccentricity and perihelion can accrue an additional error of ±5 hours. For 18 million years in the past, the quoted range of validity for the quasi-periodic approximation of the precession, and until 2 million years in the future the error can amount to ±30 hours. Using it for the entire range of Laskar’s data (−20M to +10M) shows a maximum error of ±60 hours. 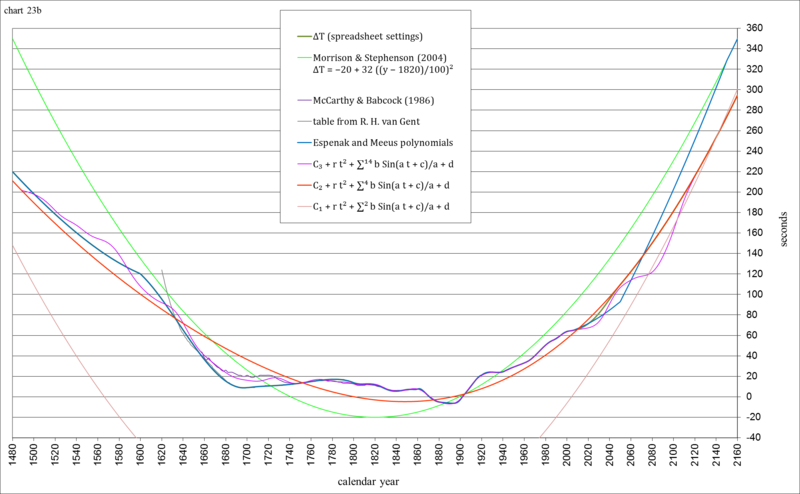 By use of the approximation formula for eccentricity and perihelion from −15M to +5M (its quoted range of validity) there can be an additional error of ±60 hours, while using it from −20M to +10M shows a maximum additional error of ±100 hours, or about 4 days. 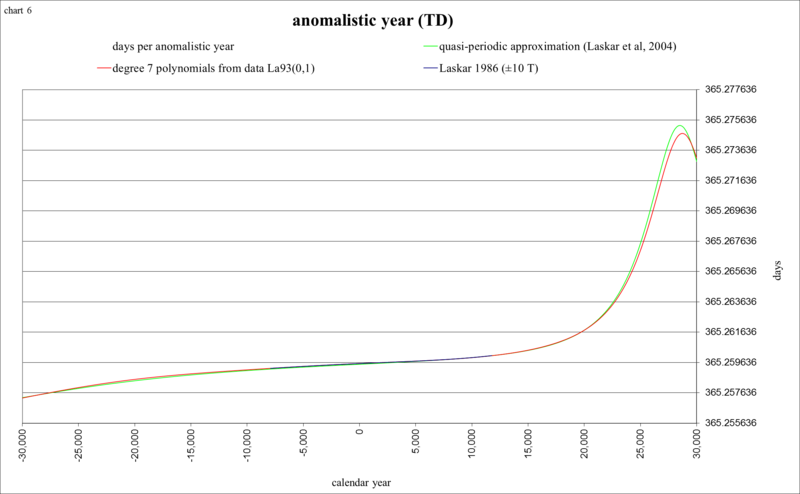 These stated “errors” are given in dynamical time (TD), and are actually quite insignificant when compared to the unknown quantity ΔT (TD − UT), which at −20M quite possibly reaches more than 20,000,000 days! 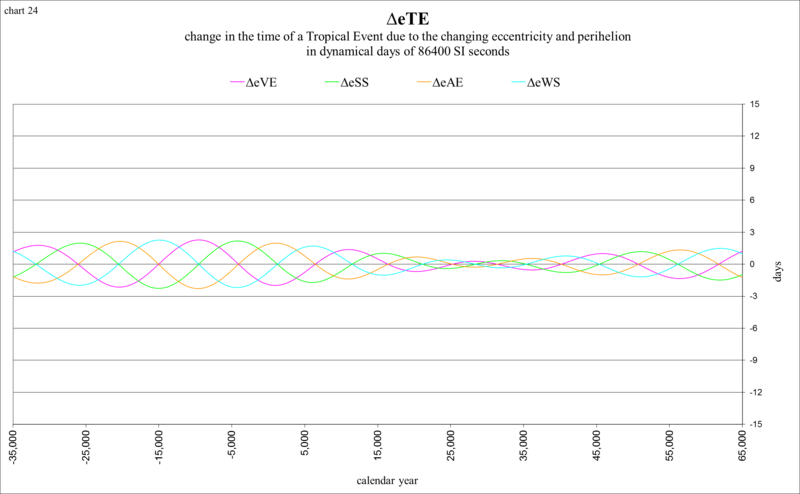 The following charts plot the dates and times of the 4 “tropical events” in the Gregorian calendar for ±30,000 yrs. They are calculated with “correct” mean orbital elements (using Laskar’s data beyond ±10,000 yrs). 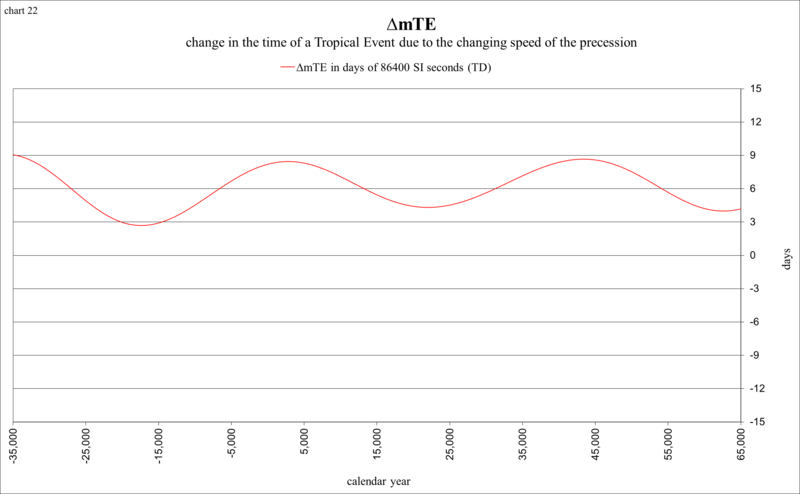 I have labeled these “eccentric” tropical events (eTE) to reflect that they are calculated from pure ellipse. 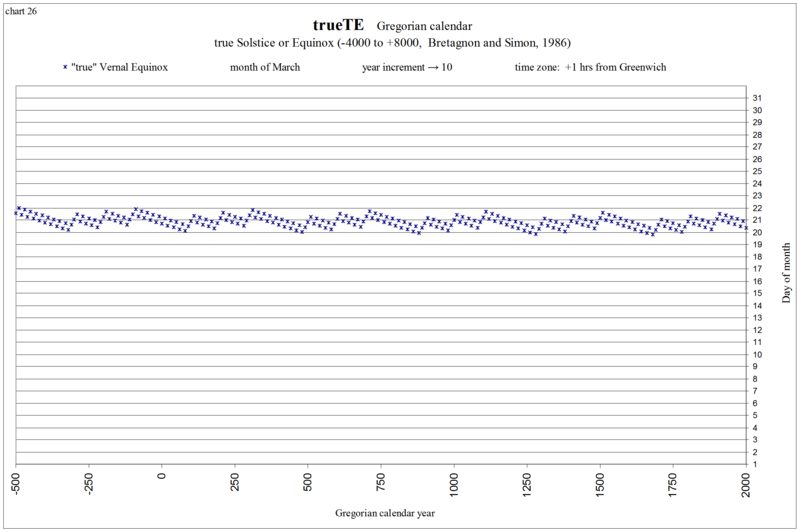 Whereas I use “true” tropical event for a solstice or equinox calculated by the method of Bretagnon and Simon (1986), as these include the effects of our true orbit (perturbed by the Moon and planets). 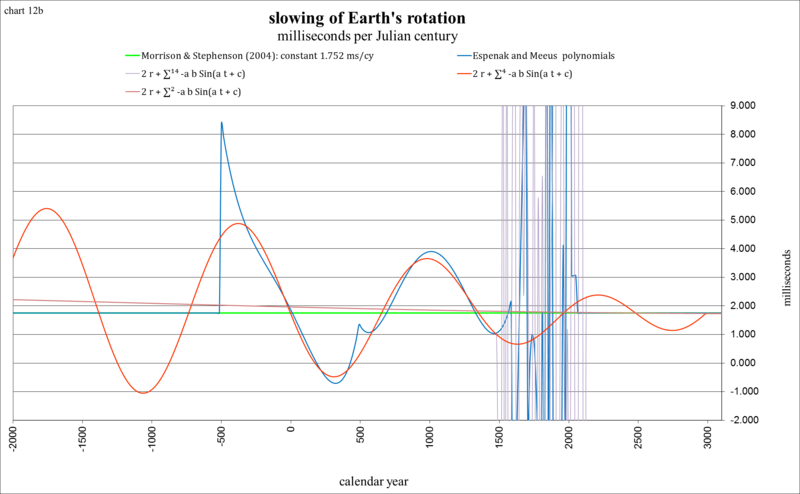 We can see from this short study that the solstices and equinoxes would remain in their “proper” months for about 50,000 years in the future, if Earth’s rotation rate did not slow down. 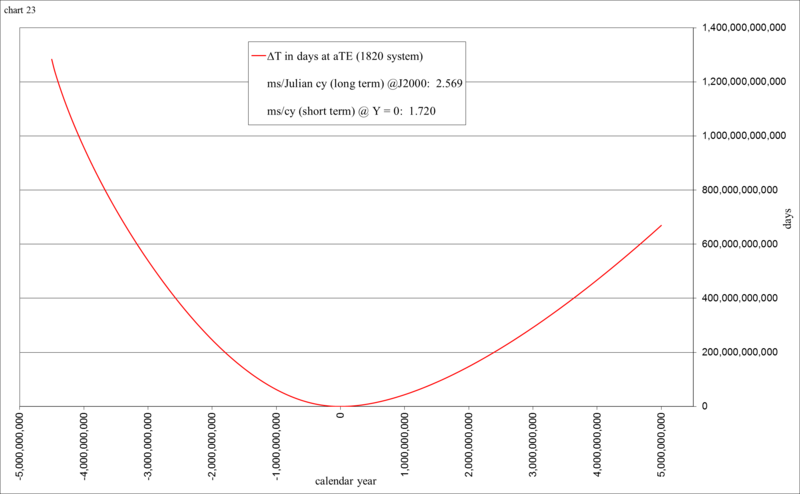 The reason they still fall out of their respective months, even with this “fictitious” assumption that ΔT = 0, is of course that our calendar depicts the tropical year to be 365 97/400 (365.2425) days in length: slightly longer than an average tropical year of 365.242138. The general shapes of the curves are seen to correspond to the sum of 3 values. 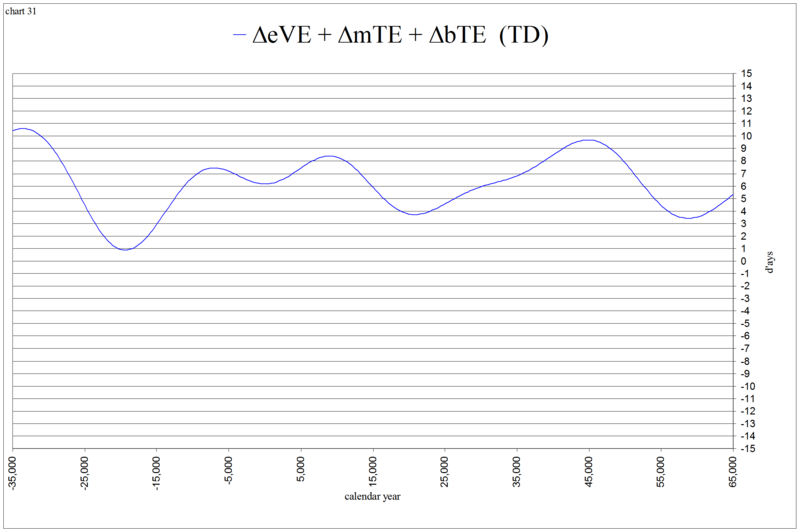 For the vernal equinox I’ve labeled them ΔeVE + ΔmTE + ΔbTE. (TD) indicates that these values are measured in days of dynamical time. 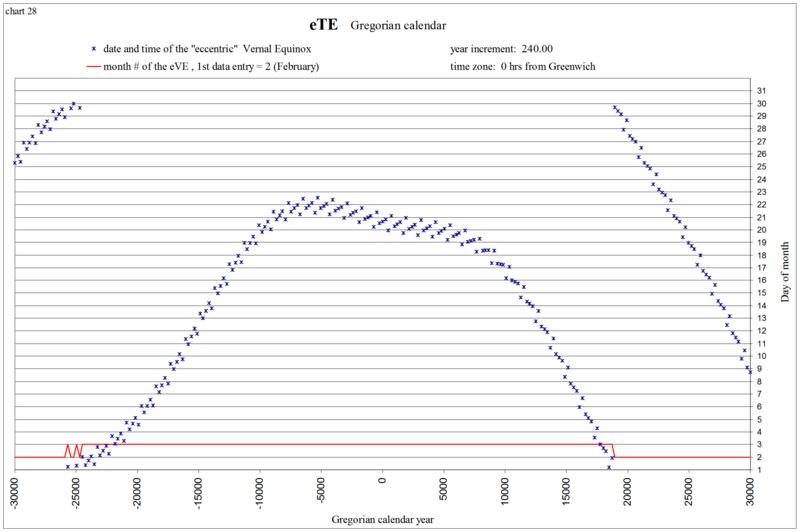 ΔeVE measures the effects of the eccentricity and position of the perihelion upon the vernal equinox. 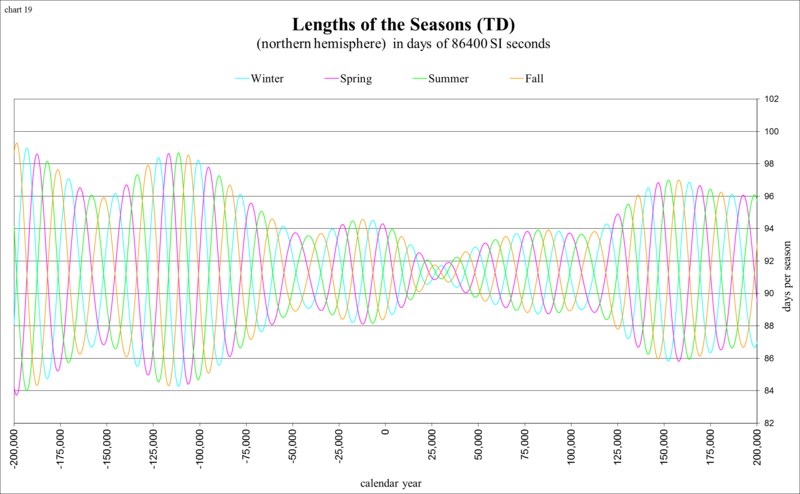 It is the difference, in time, between a vernal equinox calculated in elliptical orbit, and one calculated in circular orbit. 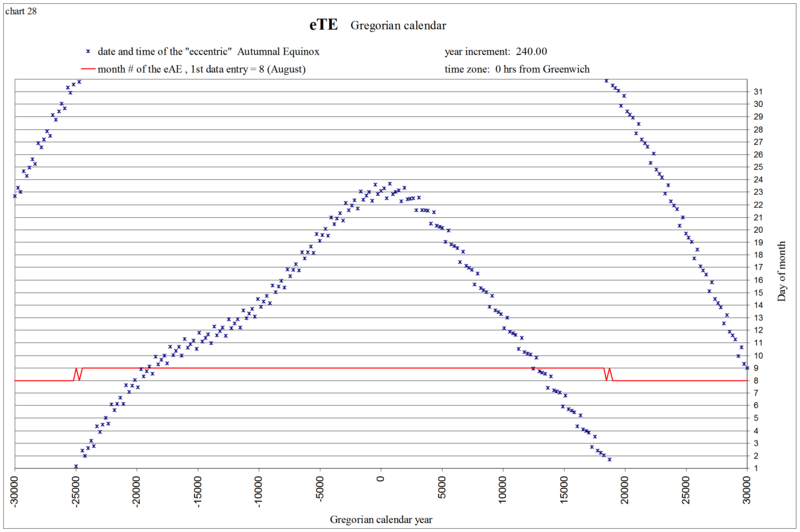 For an unperturbed elliptical orbit it is the value , where C is the “equation of center” at a vernal equinox, and nt is the “tropical” mean motion, measured as 360° per mean tropical year. 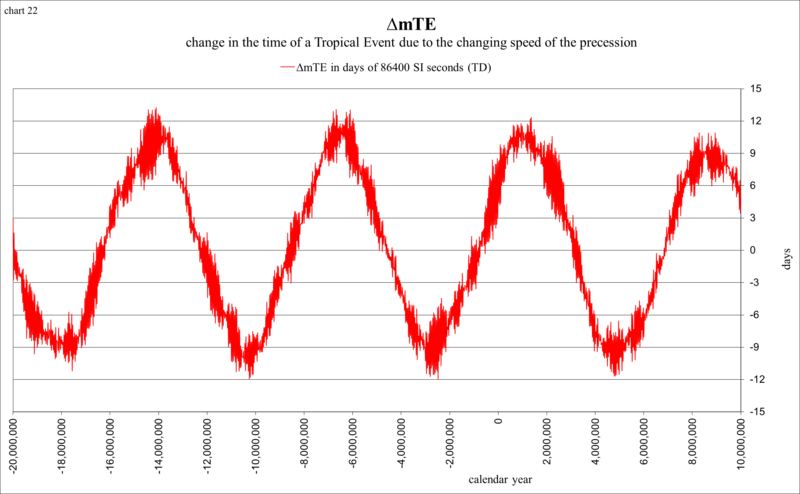 ΔmTE measures the effects of the changing speed of the precession upon a solstice or equinox (tropical event, TE). 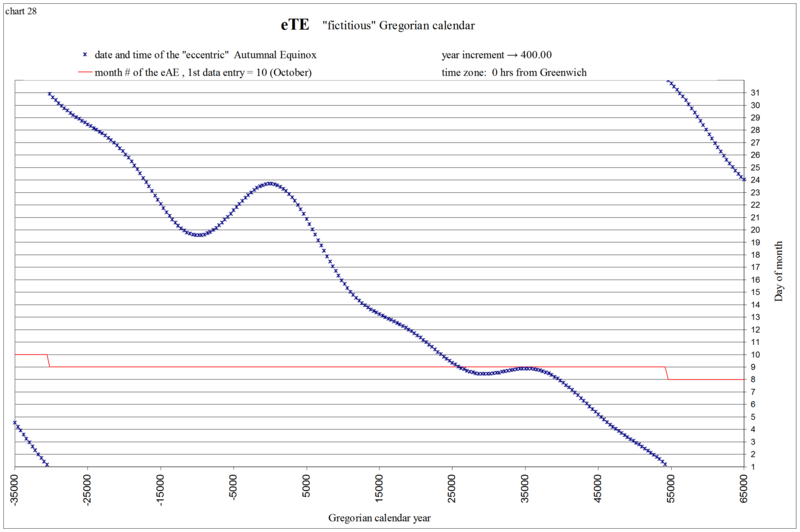 It is the difference, in time, between a solstice or equinox calculated with the “true” precession in longitude, and one calculated with a long-term “average” precession rate. 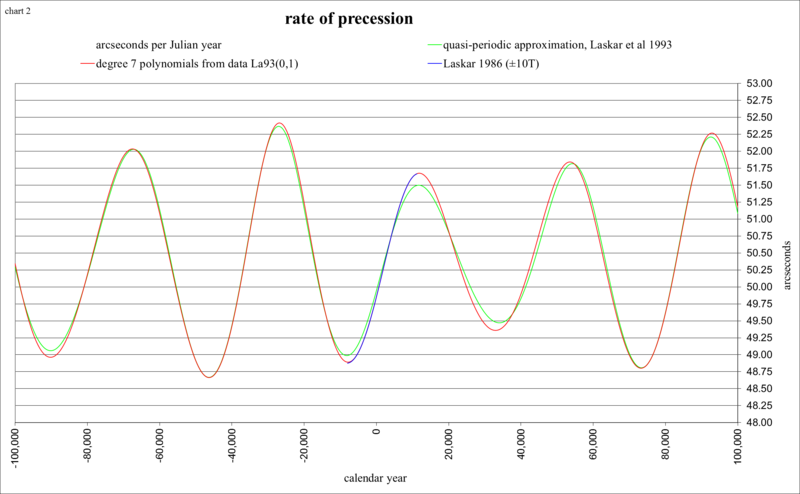 By the use of the solution La93(0,1) this long-term average rate is also constant, 50.4712 arcseconds per Julian year. This allows our simple study to remain quite simple (other of his solutions show this long-term average rate to be slowly decreasing). 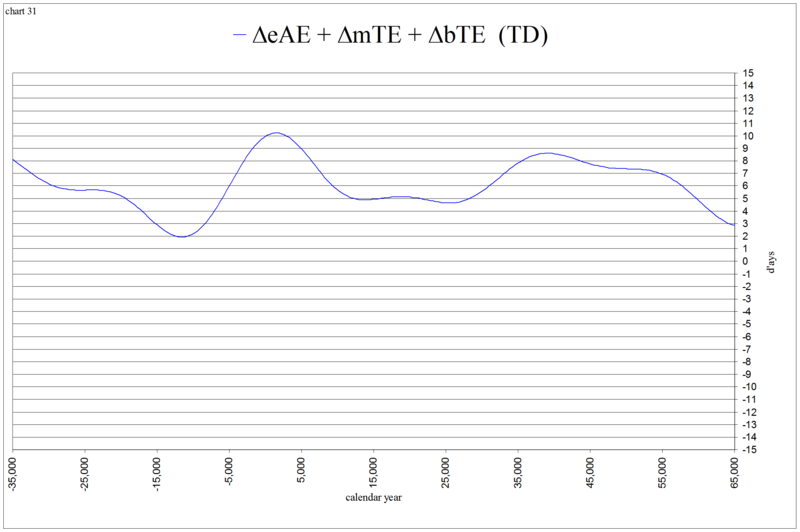 ΔbTE measures the effects of the changing length of the sidereal year upon a solstice or equinox. 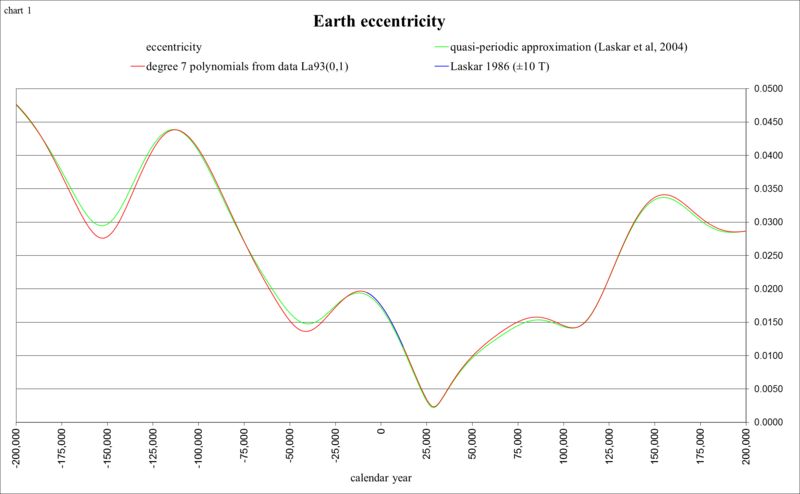 It is the difference in time between a solstice or equinox calculated with a changing sidereal year, and one calculated with a constant long-term “average” sidereal year. Its effects are supposed to be very minor. 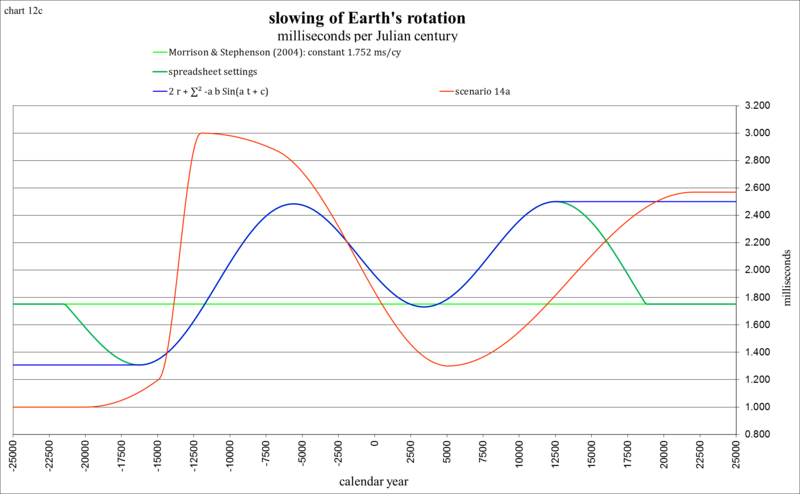 The reason ΔmTE is not currently centered around zero is that the precession in longitude shows general trends of “slightly faster” than average, and “slightly slower” than average, in regular cycles of ~4 million years. 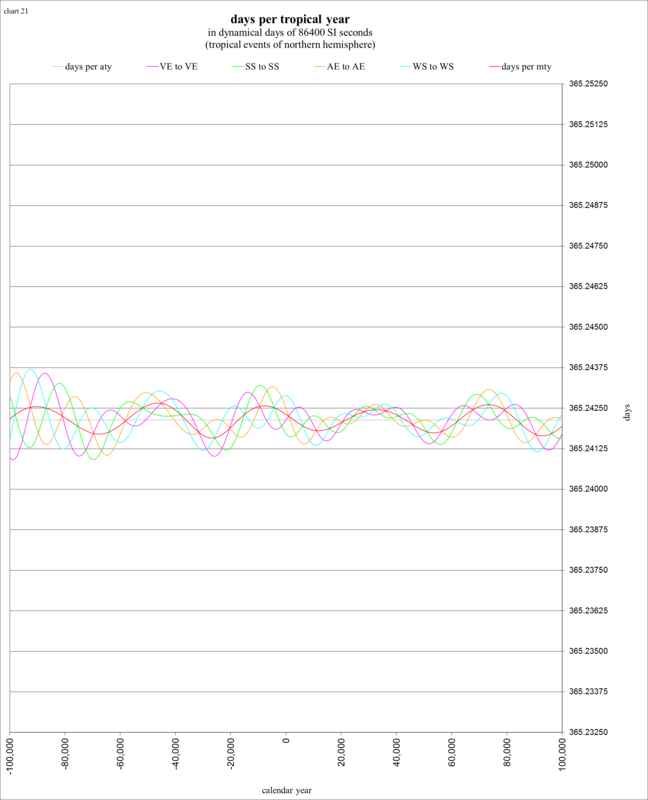 The next chart shows ΔmTE from −20M to +10M, using 1500 data points (all of the previous charts have used 250). 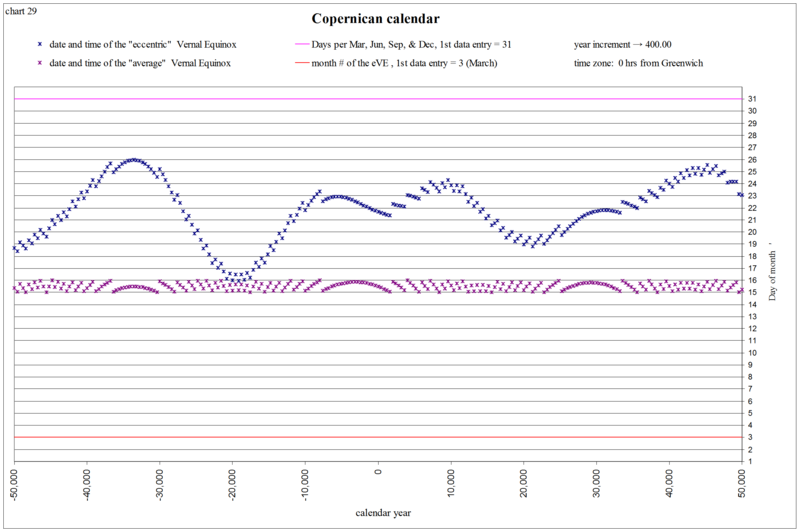 Once again, it is the difference between the “true” precession in longitude, and an “average” precession in longitude described by 360° per 25678 Julian years (50".4712 per yr), converted to time and expressed as ‘days’ of dynamical time. 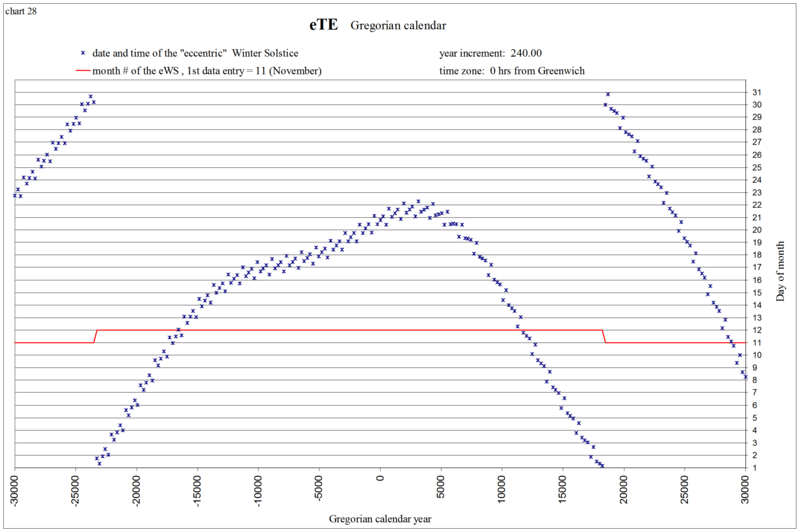 What this chart is telling us is that about 3 million years ago the variations to the precession in longitude caused solstices and equinoxes to occur about 12 days sooner than average, and 1 million years in the future about 12 days later than average. The precession is currently causing them to occur about 8 days later than the long-term average. Place the “average” vernal equinox “mid-March”. Place the “average” summer solstice “mid-June”. Place the “average” autumnal equinox “mid-September”. 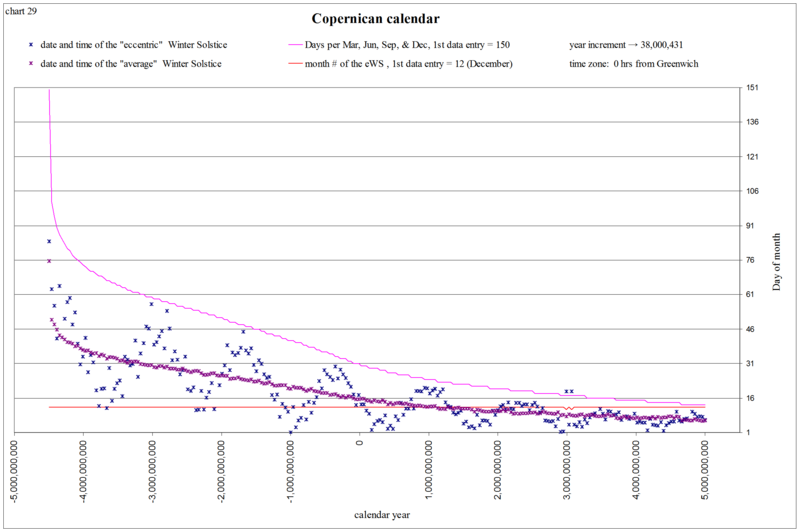 Place the “average” winter solstice “mid-December”. By another “rule” it defines “mid-month” to currently be the 15th. 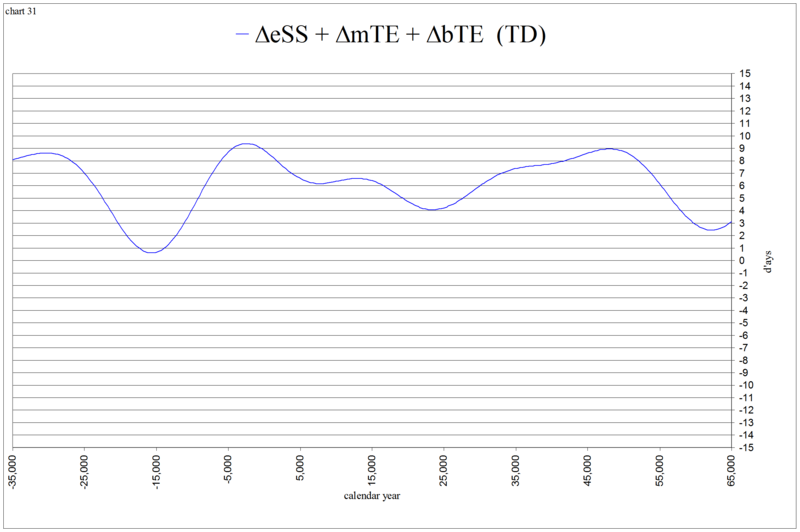 The next chart shows the values of ΔeTE + ΔmTE + ΔbTE converted to Universal time (or our estimation of UT) for ±100,000 years. It gives us a general idea of the changes in the day of the month that each solstice and equinox will occur in this calendar. The next charts separately plot the date and time of each solstice and equinox in this calendar. 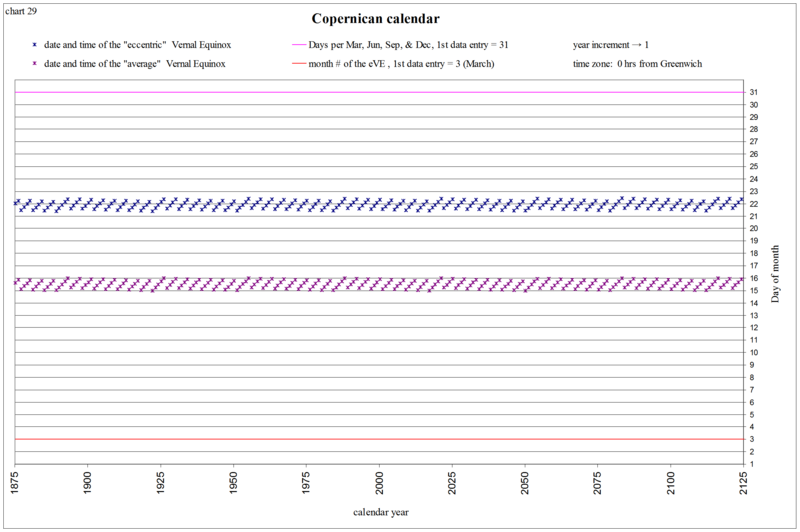 I enjoy labeling this a “Copernican” calendar, as it assumes we are in “circular” orbit, making the “seasons” (the calendar quarters) equal in length. 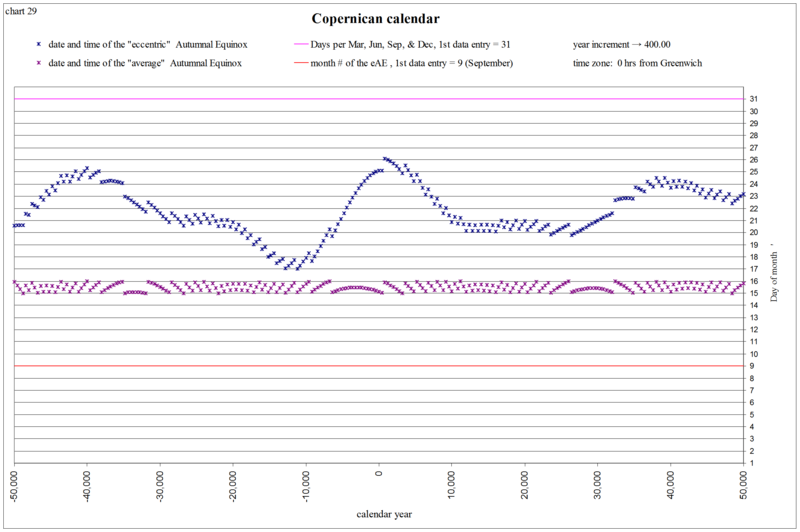 It also assumes that the length of the sidereal year is constant (unchanging), and that the rate of precession is constant, so that the length of the (average) tropical year is a constant length of dynamical time. I also rather like this label because he is often described as the progenitor of modern scientific advancement, as in the “Copernican Revolution”. 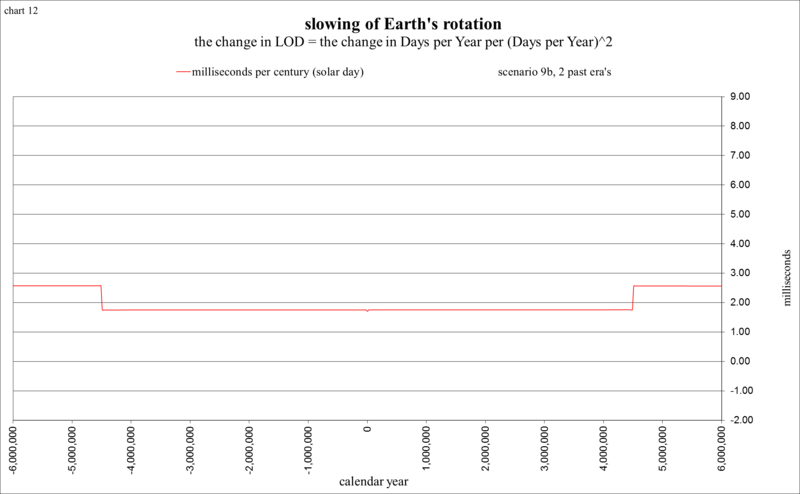 One of the most profound modern discoveries (as far as a calendar is concerned) is that the Earth’s spin rate is slowing down, mostly due to tidal friction. 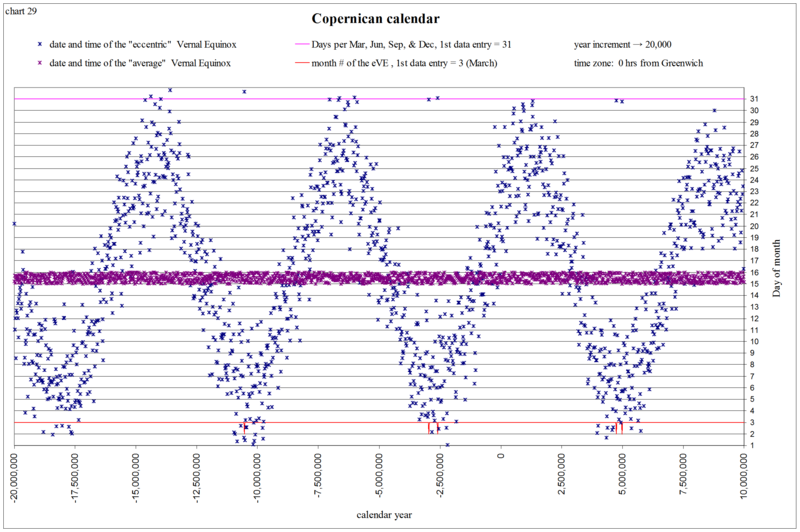 To include this phenomenon in a calendar, and attribute it’s discovery to the Copernican Revolution, provides further enjoyment in labeling this a “Copernican calendar”. You, of course, can name it anything you like, change some of the “rules”, and create a calendar of your own. 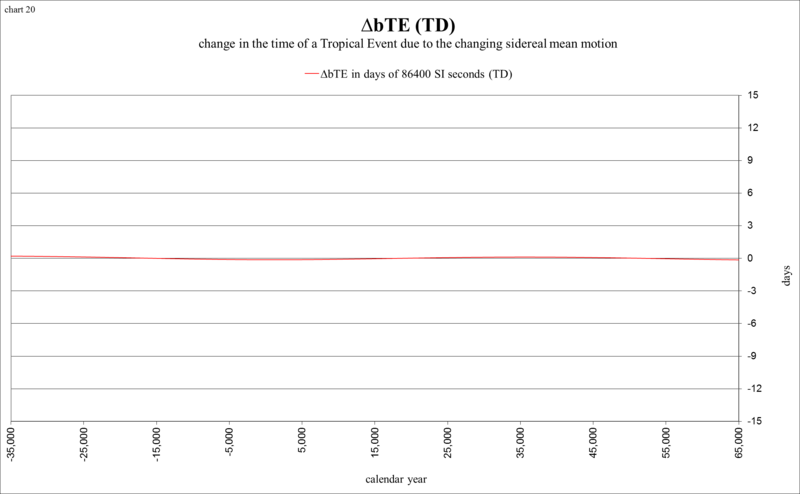 The “average” tropical events are also plotted, to make sure that they are currently occurring on the 15th of the month (in Greenwich). Beyond −20M to +10M the solstices and equinoxes that the spreadsheet calculates are of course no longer valid (even though it continues to calculate them from the quasi-periodic approximation formulae), but it continues to count the days per year and divide the 12 months according to the “rules”. This particular scenario shows 482 days per year 686,000,000 years ago, and divides the 12 months into 38 days each, with mid-month defined as the 19th. 5 billion years in the future it shows 152 days per year, 13 days per month, with mid-month defined as the 6th. 1.0 ms/cy is shown at −20,000 (20001 BC). It is supposed to represent the latter stage of the last ice-age. Our rate of slowing is supposed to be much less during glaciations (ice-ages), as the sea levels are lower, and most of the tidal friction occurs in the hydrosphere, which is mainly the oceans. From −20,000 to −3M the rate climbs slowly up to 1.4 ms/cy. 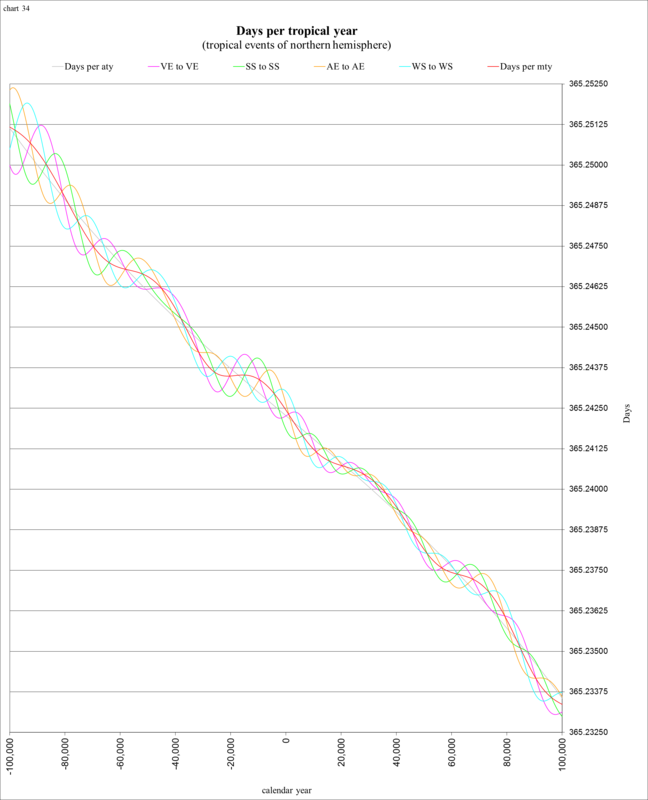 This is intended to show an average rate of 1.2 ms/cy during the last 3 million years. It is a value suggested by Lourens et al (2001), from their study of core drillings in the Mediterranean Sea from 3 million years ago. This scenario then slowly increases to a more scientifically expected rate of 2.4 ms/cy at −3.5M. At −20,000 (the minimum of 1.0 ms/cy in the chart above) the Earth’s shape is supposed to be in equilibrium. That is, she no longer needs to shift any more solid earth-mass from the polar regions into the equatorial region to compensate for the heavy ice loads at the poles and the lower sea level. The sharp increase to 3.0 ms/cy from −15,000 to −12,000 is supposed to represent the melting of the glaciers and the rising of the sea level. Imagine Earth to be like a spinning ice-skater. When the huge ice mass at the poles melts and sends the water mass towards the equator, this is like a spinning ice-skater slowly extending her arms, decreasing her measured moment of inertia and causing her to spin more slowly. The peak at 3.0 is supposed to represent the epoch in which the movement of water mass was at a maximum, and before “post-glacial rebound” was starting to have much effect. The period between −12,000 and −8,000 is supposed to represent a combination of continued sea level rising and post-glacial rebound. From −8,000 to +22,000 (22,000 AD) the curve is supposed to represent our current era of post-glacial rebound (in which the ice-skater is drawing her arms inward causing her to spin faster). The Earth’s shape is shown to be back in equilibrium at +22,000, no longer needing to shift any more mass from the equator to the poles. It then continues on into the future at a scientifically expected rate of 2.4 ms/cy. The minimum of 1.3 is supposed to represent the epoch (about +5,000 in this scenario) in which the rate of movement of solid earth-mass (from post-glacial rebound) is at a maximum. 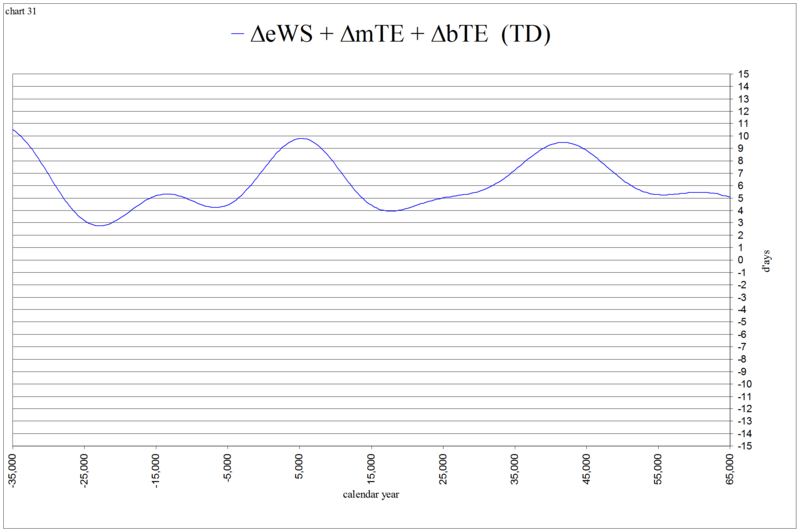 Scenario 9b charted below uses the accuracy of the “sum of sines” for about ±20,000 years, then shows a constant rate of 1.75 ms/cy during the past 4.5 million years. 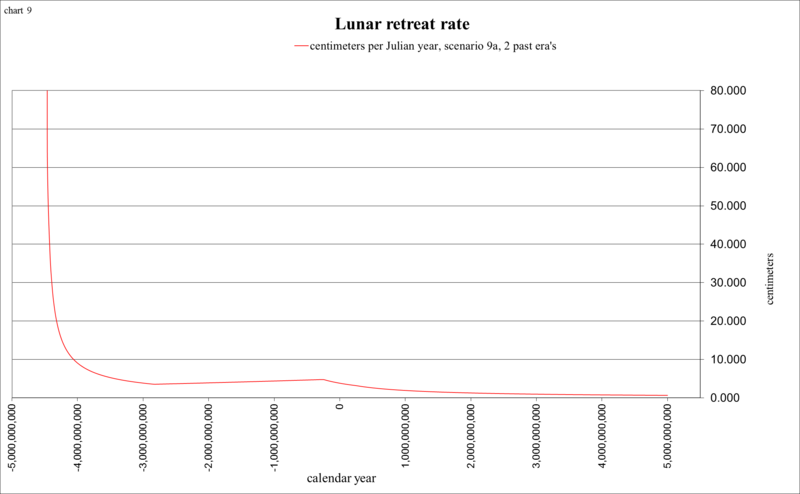 My reasoning is this: if the average rate during the past 3 million years (from Lourens et al 2001) was 1.2 ms/cy and then the rate suddenly increased to as much as 2.6 ms/cy (from Laskar et al 2004), it would probably take at least another 1½ million years for the scenario’s rate of 1.75 to be showing the “correct” LOD at −4.5M. At −4.5M it simply steps up to the more scientifically expected rate of 2.5 ms/cy. Not being able to predict that the future will be much different than the past, it simply shows 1.75 ms/cy for 4.5 million years into the future, where it steps up to 2.5 ms/cy. 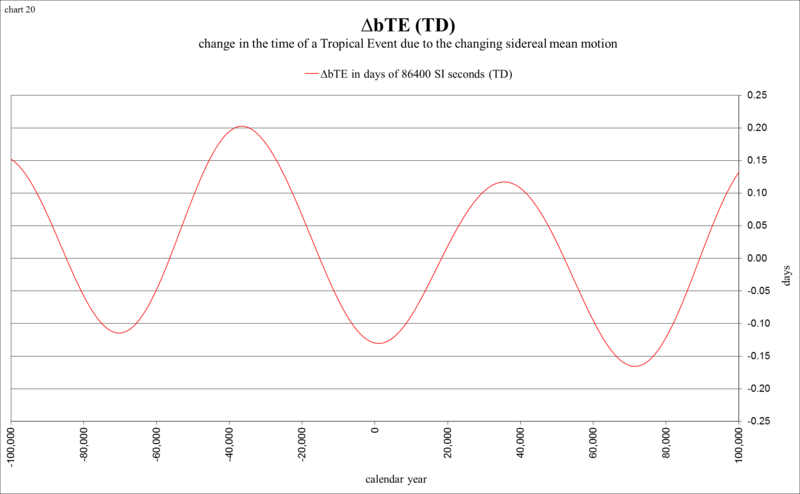 Scenario 9c is the same as 9b, but uses a simpler fraction to represent the length of the average tropical year (aty). 9b uses 365.2421378, while 9c uses 365 77/318 (365.24213836…). This is “allowed” for this spreadsheet, due to the fact that we don’t really know the true length of the long term average sidereal year (asy). 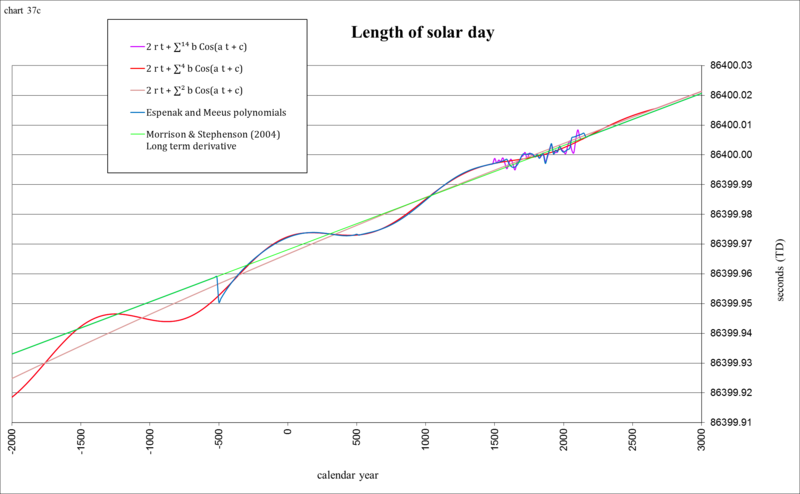 This scenario uses 365.2563624… as the average sidereal year so that the average precession rate is still 50".4712/Julian year. The spreadsheet requires you to enter the fractional portions of asy and aty as proper fractions. 14a and 9b use 365 121069/500000 for the average tropical year so that the nicely rounded decimal representation of 365.2421378 is achieved. Using proper fractions is just something I enjoy, so you’ll have to put up with this little “quirk” of mine. Rather than “rounding” to seven decimal places, I have fun “rounding” to the simplest fraction that also rounds to the same seven decimals. 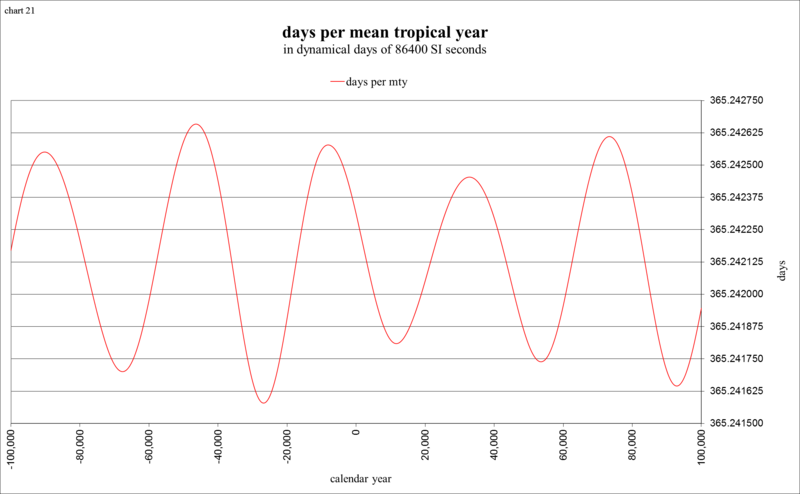 A few scenarios use 365 1409/5819 for the average tropical year (= 365.24213782…). (from line 5.) is a fraction’s “definition”, and will always be in it’s proper “reduced” form, the same as all of the fractions from the farey tree. (GCF) indicates the point in the algorithm where the greatest common factor can be determined, even though it is not used to display the fraction in its proper reduced form. is used. It is not necessary to understand this in order to use the spreadsheet. The bottom portion of sheet f! does use this algorithm and is part of the main spreadsheet. I could have more easily used a “continued fraction” algorithm for the bottom portion, but I just recently learned about continued fractions, so for now I’ve left it as it is. A continued fraction finds the closest fraction (to the number in question) on each successive level of this structure, whereas this “construction algorithm” finds the two that are closest, a/c & b/d . It is of course between the two, and in fact constructed (by means of a farey sum) of the two it is between, on each level. The Excel file ConstructionAlgorithm(xn).xls is the same as the top portion of sheet f!, but with the precision of Xnumbers (a required Add-In available from Foxes Team that can calculate to a precision of up to 250 significant digits), for anyone interested in delving into deeper levels of this structure. There is only one more (extreme) “oddity” that requires discussion, and this involves the unknown changes to our semi-major axis (and therefore the unknown changes to the length of the sidereal year). From (what portions I can understand of) Laskar’s publications, his model of the solar system is a “second order general theory”, and that it would require a third order theory to accurately detect the changes to the semi-axes of the planets. And that it would be right next to impossible to even think about the integration of the equations of motion to the third order with respect to the masses of the planets for millions and millions of years! In order to derive his polynomial description for ±10,000 yrs (Laskar, 1986), (from what I can understand) the third order from existing classical theory was considered. My first idea to extend the known changes beyond ±10,000 came from the title of the article “fitting a line to a sine” by J Laskar and J-L Simon, 1988. 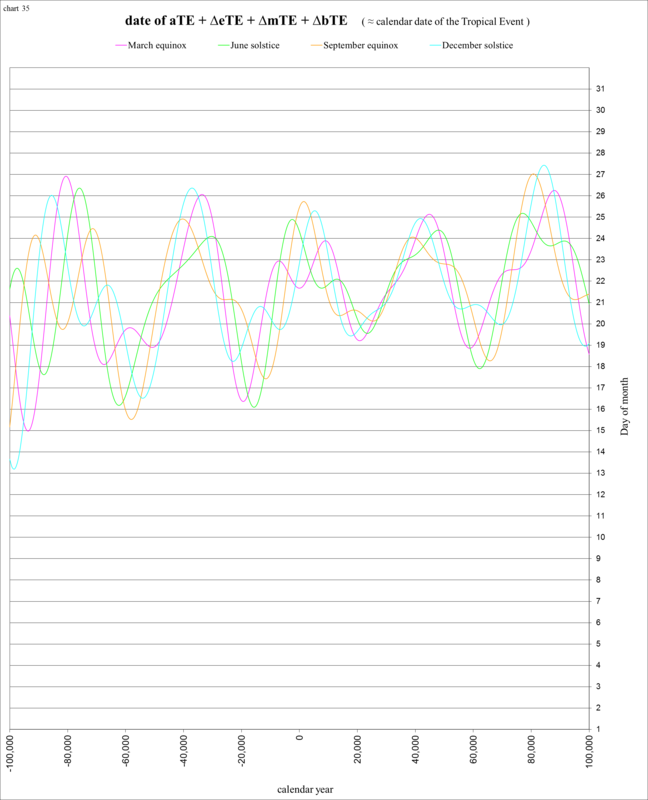 My intention was to show (by a simple sine wave) the semi-axis returning to an “average” at about ±35,000 and then simply continuing with the constant, unchanging average beyond that range. This, however, produced an ugly “blip” in some of the charts: whereas the frequency of the integral is the same, it is exactly out of phase. 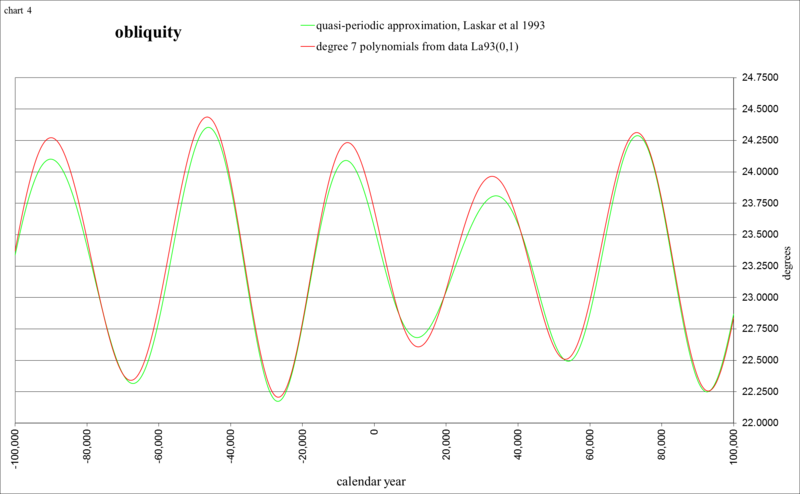 To continue with this same sine function for millions of years removed the “blip”, but was endlessly boring, showing the same frequency and amplitude year after year after year. Simply to relieve my boredom, I decided to use the frequencies from the inclination variables from the quasi-periodic approximation formula from Laskar et al (2004), as they also show frequencies of about 70,000 yrs. It is important to note that this is not a scientific method, it is more on the order of “pick a formula, any formula” and force it to fit. 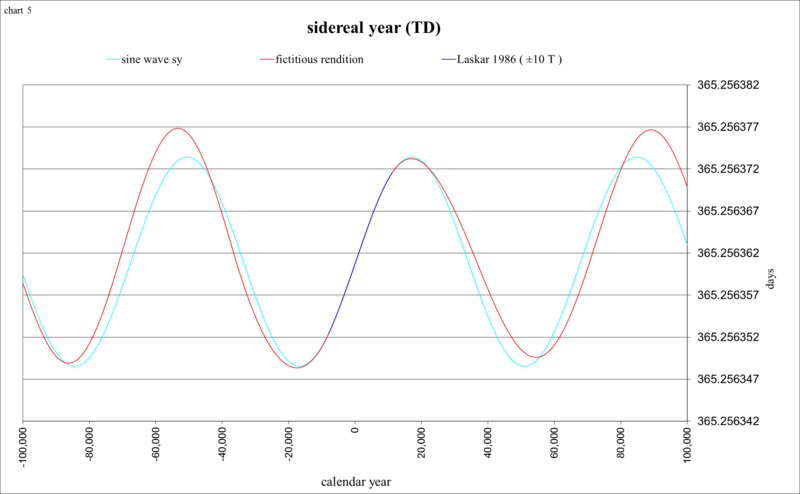 The amplitudes have been adjusted in an extremely unscientific manner, simply to show some slight variation, and to “agree” with any reasonable choice for a “long term average sidereal year”. Once again, the description of the sidereal year in this spreadsheet is to be considered fictitious beyond ±10,000 yrs. 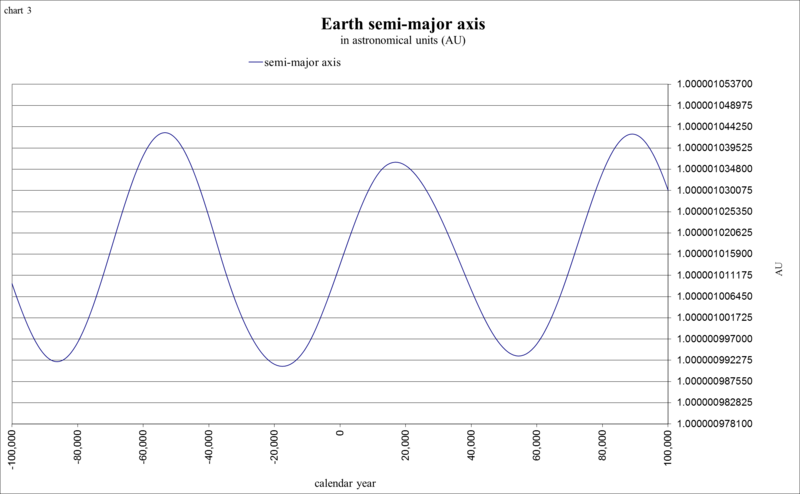 It is used merely for interest, to depict a “possible” history of amplitudes, and to continue calculating in a “correct” manner, which would include our changing semi-major axis. 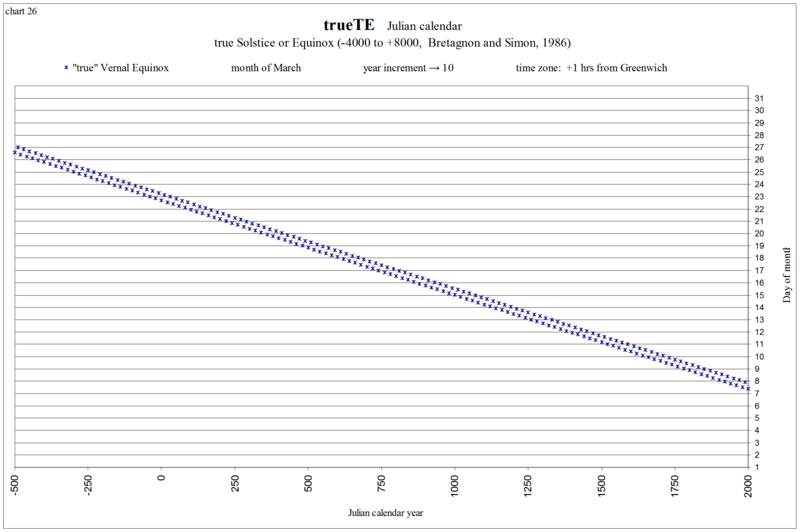 If you would rather not use this fictitious rendition, it is very easy to direct the spreadsheet to calculate with the average sidereal year, and ∆bTE will simply always equal zero. The additional “error” in calculating a solstice or equinox, during ±10,000 yrs from J2000, without using the “correct” length of the sidereal year (from Laskar 1986) is only about 1½ hours of time. ∆bTE involves the integral of the (changing) sidereal year. 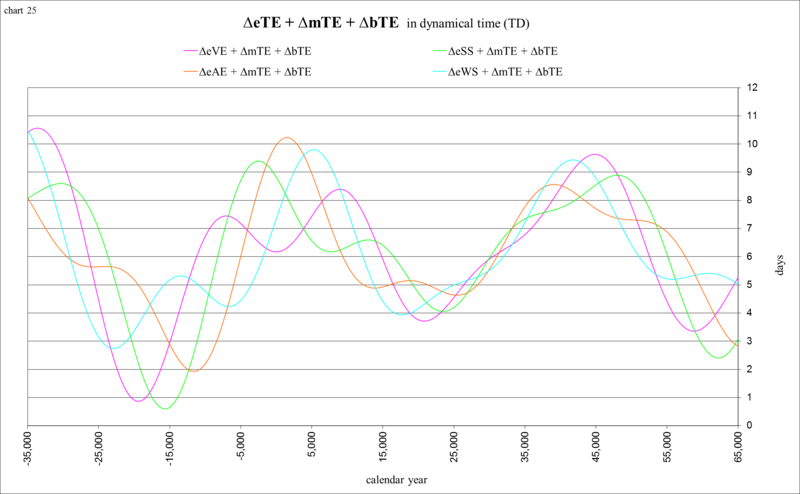 At ~1000 AD the sidereal year is shown to be at the average, while ∆bTE is at a minimum, due to the previous 35,000 years, during which time the sidereal year was below average. McCarthy, Dennis D., Precision time and the rotation of the Earth, Transits of Venus: New Views of the Solar System and Galaxy Proceedings IAU Colloquium No. 196, 2004, D.W. Kurtz, ed. Notice: due to a Windows security measure all of the zipped files that you download might be “blocked”. Before unzipping right-click the .zip, choose “Properties”, then in the “General” tab click “Unblock”, “Apply”, and “OK”. Otherwise you might need to perform these steps on each individual file (especially .chm helpfiles). If you are interested in using the Excel Add-In for the interpolation of Laskar’s La93(0,1) data from −20M to +10M, you can read a description of the functions in OrbitalElements1.7.pdf, and download OE.xlam1.7 for Excel 2007/2010, or OE.xla1.7 for 97/2000/XP/2003. This newer version 1.7 has a bug fix for Excel 97 & 2000. If you would like to use the spreadsheet that created the charts on this webpage, you can read the “short” instructions to start, and download ECT1.6.xlsm for Excel 2007/2010, or ECT1.6.xls for Excel 97/2000/XP/2003. If you are interested in the method being used to calculate the approximate times of solstices and equinoxes, download TEequation.pdf. This updated pdf also contains a new ΔT section with readjusted “double precision” formulae for the entire time span −4.5G to +5G. There are two additional Add-Ins required to use this workbook. The 1st is “Analysis Toolpak” (on your Office CD if it isn’t already installed), in order to read the function “SERIESSUM( )”. The 2nd is “Xnumbers v.6.0”, a remarkable math tool for Excel. All of these Add-Ins are being distributed as open source, fully accessible to modify and redistribute as you desire, as long as you give credit to the original authors, Leonardo Volpi from Foxes Team for the Xnumbers Add-Ins, and John Beyers for the Orbital Elements Add-Ins. For any other questions or comments, or (if you aren’t too comfortable with Excel and/or all of these Add-Ins) to request custom charts (in Word), and/or data to create them (in Excel) for specific time spans and parameters: email to steve@thetropicalevents.com. 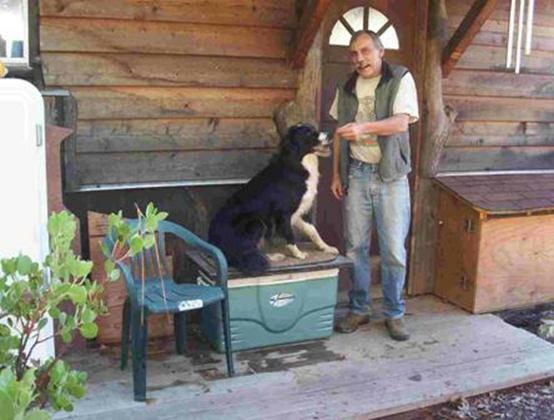 Please be very patient to receive a reply, as I am usually at home, a “little cabin in the woods”, with my dog Tuxedo, far from the city lights (and an internet connection). P.S. to help bring an “ancient astronomer” (or “old carpenter who uses fractions”) up to date in the modern world, don’t hesitate to donate to the solar system (electric) and satellite (internet connection) fund!